Whitewater rafting is an exciting way to enjoy the great outdoors. You'll get a great view of the local scenery from the river, plus the thrill of encountering stretches of rapids. Even young kids can enjoy the ride if you pick a rafting trip on an appropriate class of river. Some companies take kids as young as four. 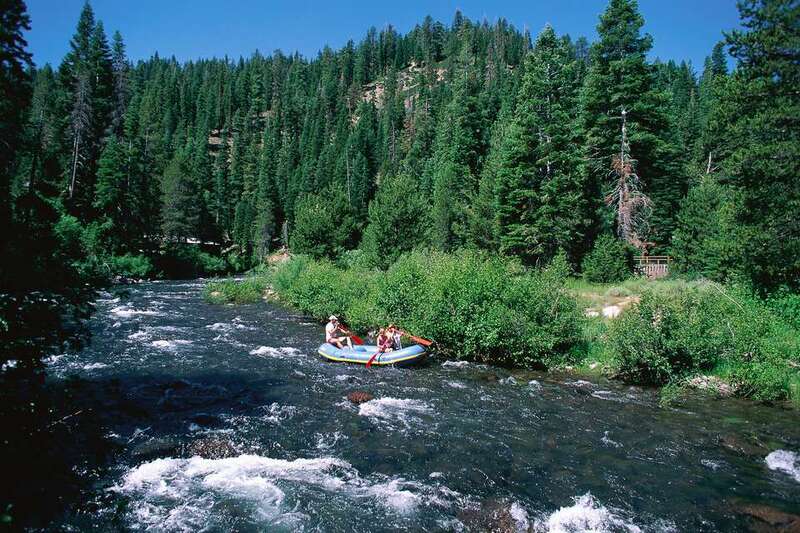 And if you want to opt entirely out of the whitewater part, many outfitters also offer a calm river float downstream. Sometimes it's possible to take a dip as you float along. Novice families can definitely go whitewater rafting, ranging from half-day trips to overnight adventures. Typically, on a whitewater river rafting trip, guests team up in large inflatable multi-person rafts, with at least one guide per raft. Every crew member is expected to paddle, following the guide's instructions, and that's a big part of the fun. Any river rafting trip typically starts off with a short training session, and it's expected that all participants are novices so don't worry if you've never gone rafting before. Kids are frequent participants and river rafting companies have policies about minimum ages for specific trips. Class I is the easiest and tamest type of whitewater rafting and difficulty increases up to Class VI. Class III has small waves and maybe a few small drops. Class IV has medium waves and perhaps a few rocks and drops. Most family trips with young children will be on Class I or II rapids. Kids over 8 may be allowed on Class III rivers, which have more whitewater excitement. The simplest and most affordable way to sample whitewater rafting is to vacation in an area where the river rafting is known to be good. Simply include a day-long or half-day rafting trip as part of your getaway. Idaho, Utah, Colorado, and West Virginia are all good whitewater destinations but really, there are options in virtually every region. Remember that rivers change with the time of year. Sinc they are fed by mountain snow thaws, rivers may be thrilling early in the season and much tamer in late summer. Also, conditions vary year to year depending on the winter's yearly snowfall. If you have concerns, here are questions to ask your outfitter. You can also try rafting on some tropical islands. For example, in the Dominican Republic, visitors can sample whitewater rafting as a day trip. It's lots of fun, and a great way to see more of the island than just beaches. Fall and winter are best seasons, following the island's rainy season. Another way to sample whitewater rafting is as part of a multi-day family adventure trip. For instance, a Yellowstone Family Adventure we sampled included a fun half-day river rafting trip. Many of Adventures by Disney's family tours include a half-day or day-long rafting trip. You can notch up a step by opting for an overnight experience. Rafting the Grand Canyon, for example, is a multi-day trip. Be prepared for the elements. You'll be totally exposed to the sun, and also you'll get soaked. Sunglasses and hats might get lost. Consider bringing a dry bag to keep your cell phone safe. Space on a raft is limited. Don't expect to bring a large bag of belongings. Try to resist pushing your child before he or she is ready for a higher class of rapids. Being terrified is not a fun vacation.